Prepare taco meat according to packet seasoning directions, cool. 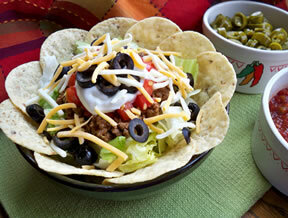 In a tortilla taco salad bowl or a regular salad bowl, add the lettuce. Add a serving of taco meat on top of the lettuce. Then top the meat with the other ingredients you wish to include with your salad. Choose from tomatoes, onion, sour cream, black olives, cheese, and beans (optional). 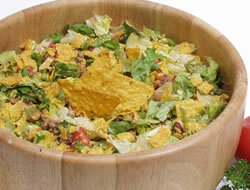 If serving in a regular salad bowl, line the outside of the bowl with tortilla chips to eat with your salad. Serve with Thousand Island or French dressing. 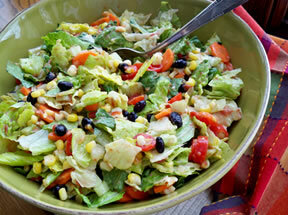 Serve salsa, taco sauce, and jalapenos, on the side for those who like to add them to their salad. "Good taco salad. I added all the extras so it had a lot of mingled flavors. I added the tortilla chips around the edges so I didn't have to buy expensive the taco shell bowls. It worked well."